Your body needs vitamin D to absorb calcium efficiently, keep bones healthy, control inflammation and regulate the nervous system. Although you make vitamin D when your skin is exposed to sunlight, foods and supplements can also supply vitamin D. Because salmon are high in vitamin D, salmon oil is a good source for this nutrient, but it is important to not take too much, as too much vitamin D can cause health problems. 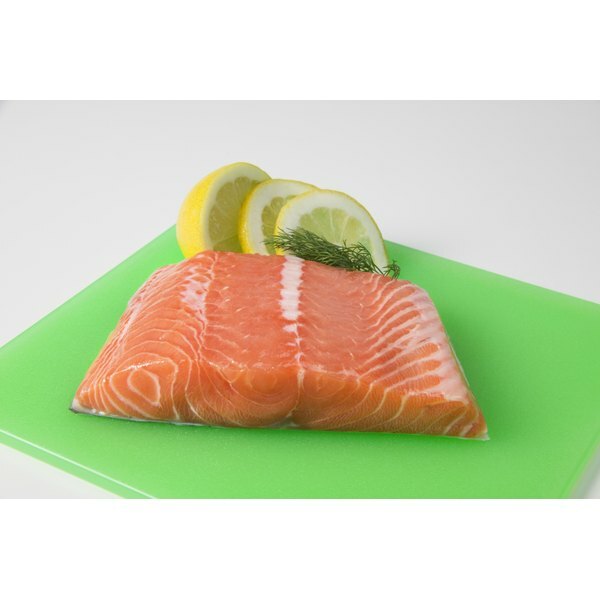 Salmon are known as fatty or oily fish, and they contain oils that are rich in omega-3 fatty acids. In addition to providing these important healthy fats, salmon oil also contains vitamin D. (See Reference 1) If you take salmon oil supplements, the amount of vitamin D in each dose will vary depending on the manufacturer. Most adults should get at least 600 IU of vitamin D each day. The Journal of Steroid Biochemistry and Molecular Biology: An Evaluation of the Vitamin D3 Content in Fish: Is the Vitamin D Content Adequate to Satisfy the Dietary Requirement for Vitamin D? What Are the Benefits of Vitamin K, D, E?